Shaving down is one of the unspoken rituals that most athletes participate in. I can remember my teammates and I discussing how we were going to ‘shave off seconds’ with our shaves that took place the night before an important meet. Athletes LOVE THEIR RITUALS and a pre-race shave is one routine that many athletes swear by. So what are the real reasons that a swimmer should shave before a race? The answers to this question may SURPRISE you. The most common MISCONCEPTION about shaving is that it can increase your hydrodynamics in the water. People will tell you that it will decrease your drag and reduce friction. Shaving does not reduce water resistance nor eliminate the amount of friction on the skin. There is no conclusive evidence to support this reason behind shaving. So when you go bare legged to the pool, do not think that decreased drag is what increasing your swim speeds. One way that shaving can give you an edge for swimming is reducing the lactic acid build up in your arms. The muscles that you use to shave your legs are the same muscles that you use to swim! So shaving actually DECREASES the amount of LACTIC ACID in these muscles because it mimics stretching. The repetitive motion is actually good for you. Decreasing lactic acid build up means that your muscles won’t produce that burning sensation when you are swimming. Not exactly what you think about being a benefit of shaving for swimming, but it counts! If you have ever had hairs in your band-aid adhesive or hairs caught in a clump, you should realize that every hair follicle has sensory nerves attached to it. One advantage to shaving is that you remove the amount of places and sensations that these follicles send to your brain. So in reality, shaving actually leads to LESS of your neural pathways being bombarded with messages about what you are sensing. You are neurologically in a better place after you shave. It does take a day or two for your neural pathways to fully calm down, but it does happen. This give you a distinct advantage because your brain is then able to focus better on other tasks! Also, anyone who has shaved before a race can tell you that they could ‘sense’ that they were going faster. This ties in with the neurological reason, but after you shave your SKIN is better able to sense the water around it. This gives you a psychological boost because you ‘feel’ as if you are going faster through the water because you are better feeling the sensation of the water on your skin. However, do not forget the benefit that participating in a ritual gives an athlete before a race. It is like the self-fulfilling prophecy. This theory states the more that you believe something will happen, the more likely it actually will happen. So if you believe that shaving will give you a drop on the competition, you will actually swim better and GET that drop on the competition. Most sports, but especially swimming, are largely a psychological and so the more of a psychological benefit you give yourself, the better. Now that we KNOW that shaving actually provides benefits to your performance we offer you a quick list of tips. 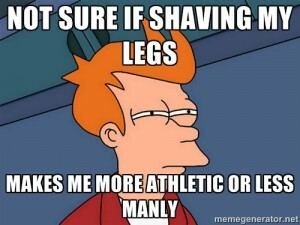 Shaving before a meet should take place 2-3 days before the big day. You get the advantage of smooth skin with time for your neural pathways to calm down. Most of these benefits specifically come from shaving your LEGS or Arms. 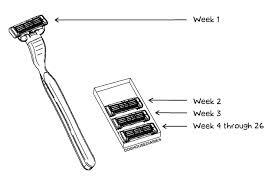 There is no need to shave off your eyebrows/head hair to get an advantage. If you are a guy who hasn’t shaved before or in a while you want to first trim down the hair with clippers and then shave. A good shave will take extra time in the shower. Speeding up the process can cause nicks and cuts. Go slow. Plan this extra time into your shower time. Are you ready to shave before the big race? Do you have any other pre-race rituals?